Grand Hotel Villa Fiorio Rome is a luxurious 4 star hotel villa nestled in the splendour of the Castelli Romani (Roman Castles) hills that surround Rome and which are renowned for their traditional cuisine and lovely wines. The villa is extremely picturesque and especially suitable as a wedding hotel for Rome. The Grand Hotel Villa Fiorio lies in a beautiful pine park precisely between the towns of Frascati and Grottaferrata and just 9km away from the Papal Summer Residence of Castel Gandolfo at Lake Albano. 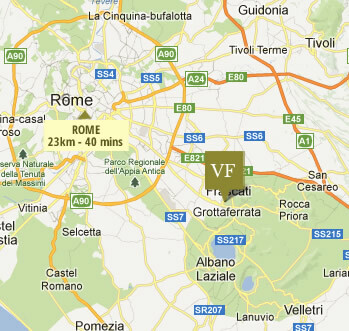 The Grand Hotel Villa Fiorio is also ideally placed for travel into Rome with a bus stop outside the hotel leading to Frascati train station from whence it is a mere 25 mins to Rome. Our 4 star hotel and banquet venue is also only 20 mins drive from Ciampino airport and also easily accessible by public transport. The villa that makes up the Grand Hotel Villa Fiorio was constructed in the early 20th century and completely refurbished to become a hotel in the 1950's. Since then it has been fully renovated with careful attention to detail to arrive at its present opulent glory. Check out our different sections for more in-depth information, or perhaps glance at our Video Tour or Photo Gallery for a more visually pleasing representation. Horse Riding in Pratoni del Vivaro - a mere 10km away.